PM publicly supported death penalty for terrorists at condolence visit, two days after reportedly thwarting a proposal to advance the issue. 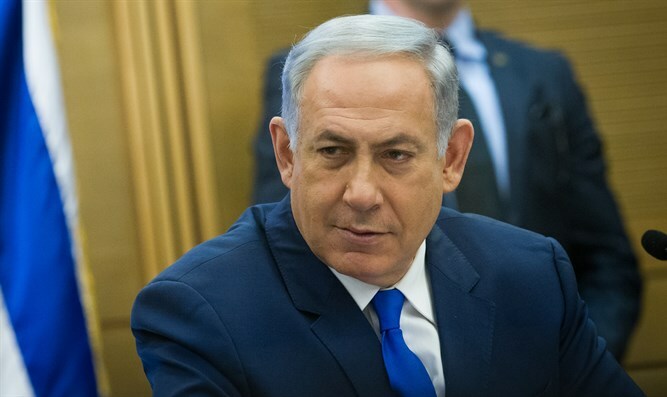 Several months ago, during a cabinet meeting, Prime Minister Binyamin Netanyahu thwarted a proposal that sought to impose a death penalty on terrorists who had committed particularly brutal acts, according to a report this morning in Haaretz. At a July 25 cabinet meeting following the murder of 3 members of the Salomon family in the community of Neve Tzuf, Defense Minister Avigdor Liberman reportedly requested that the military prosecutor seek a death penalty for the terrorist murderer, who was caught alive after the attack. Transportation Minister Yisrael Katz also supported Liberman’s position. Attorney General Avichai Mandelblit responded that the prosecution’s policy has long been not to seek the death penalty. He added that the issue was complex and had broad political implications, and he therefore did not want to make such a decision alone. He suggested that cabinet ministers authorize him to seek the death penalty for particularly cruel murders. According to the report in Haaretz, Netanyahu heard the remarks and said that they had not convened to talk about this issue, thus ending deliberations on the matter at that meeting. Two days later, the Prime Minister arrived for a condolence visit at the Salomon family home, where he specifically expressed support for the progression he had seemed to thwart two days earilier. “This is permitted by the law; it needs a unanimous decision by the judges, but they’ll want to know the position of the government as well. And my position is, as Prime Minister, that in this case, of this lowly terrorist, that he should be executed. He simply cannot be allowed to smile again,” Netanyahu said, referencing pictures taken of the terrorist smiling shortly after the attack. Several cabinet ministers present were amazed by Netanyahu’s words, in light of the gap between his rhetoric and lack of readiness to advance such a proposal when the opportunity had presented itself.